Seattle’s skyline is known for the Space Needle, but that's hardly the tallest building in the city. 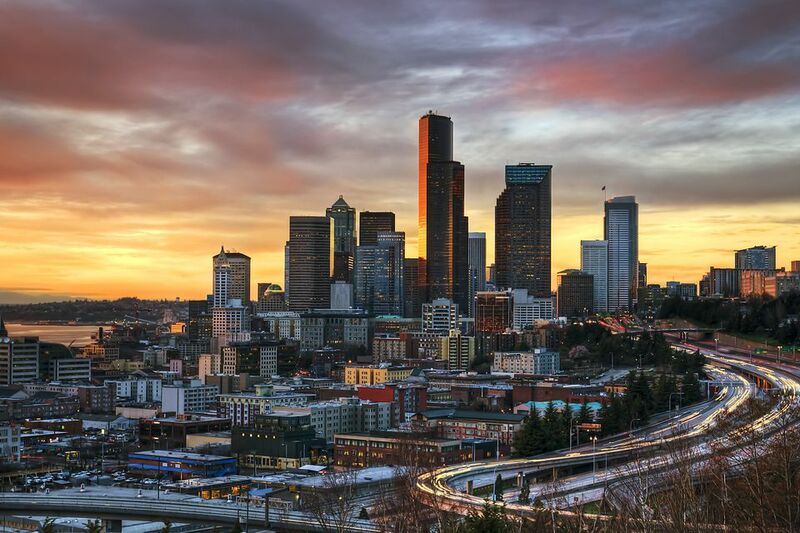 In fact, a number of Seattle's skyscrapers outrank it in height, like the Columbia Tower, which even offers a higher view deck than the famous Needle! Seattle's tallest structures are pleasantly varied, and include a nice mix of historic buildings (like the Smith Tower), towering modern office buildings (Columbia Center) and even some Art Deco appeal (1201 3rd Avenue). But while the historic buildings are interesting to look at, the highest skyscrapers in the city are newer, dating to the 1980s and 1990s with a few built in the 2000s. Some are even among the tallest buildings in the world. Seattle’s tallest building is the tall, dark Columbia Center. As of 2013, the Columbia Center is the 20th tallest building in the U.S. and the tallest building in all of Washington state. Even better, the public is allowed into this skyscraper and can enjoy the view from the Sky View Observatory on the 73rd floor. There’s a moderate admission fee that’s $20 online for adults (and $22 onsite), but this view is cheaper and higher up than the Space Needle! Formerly Washington Mutual Tower, 1201 3rd Avenue was the home of WaMu until the bank’s headquarters moved. The tower is one of Seattle’s most distinct buildings and is vaguely reminiscent of the Empire State Building. It was designed by Kohn Pedersen Fox Associates and The McKinley Architects. The Seattle Municipal Tower is home to Seattle City Light, Seattle Public Utilities, and other government offices, hence its name. In the past, this 62-story skyscraper went by more commercial names—AT&T Gateway Tower and Key Bank Tower and served as the base to those companies as well as many other companies. The tower has restaurants located on its upper floors, too. Since 2006, Safeco Plaza has been the headquarters for Safeco Insurance Company of America. Like other skyscrapers in Seattle, Safeco Plaza has gone by other names in its past, including Seattle-First National Bank Building. Other major tenants include Bank of America, Riddell Williams, and Helsell Fetterman. The Space Needle is Seattle’s most recognizable building by far—so recognizable that this distinctive landmark has become a symbol of the city. Located in Seattle Center, the Space Needle is a major tourist draw because of its observation tower and SkyCity restaurant that offer great views of the city, Lake Washington, Lake Union, mountains and Puget Sound. It's so famous that many may think this is Seattle's highest point, but really it's farther down the list than you might expect. Still, the views are pretty great. The Russell Investments Center was originally built to be the WaMu Center and be the headquarters for Washington Mutual, but around the time it was completed, WaMu failed. Since its completion in 2006, the building has been the Chase Center (Chase acquired WaMu), but in 2009 Russell Investments purchased the building and moved to Seattle from its former headquarters in Tacoma. The building includes Seattle Art Museum on the bottom four floors of part of the building and also has a very innovative feature—a private, 20,000 square foot deck on the 17th floor for workers in the building to use for strolls or a bit of outdoor time. Designed by Callison Architecture, the US Bank Center is an office building. Designed by 3D/International, this 42-story building has retail space in a complex at its base. The office space is filled by a number of tenants, which include Bank of America and Princess Tours. Formerly named the First Interstate Center, the Wells Fargo Center was designed by The McKinley Architects and has 47 stories. The building is distinct as it is six-sided and features tinted glazed glass and granite panels. While not in the top 10 tallest buildings in Seattle, other buildings are likely to catch the eyes of passerby as well. Among these is Smith Tower at 506 2nd Avenue in Pioneer Square. When it was completed in 1914, this historic building was the tallest building on the West Coast. Today, it’s still a great place to view the city from its observation deck on the 35th floor. The building is also home to office space and the Chinese Room, which is a cool place to book for events. Which Fortune 500 Companies Are in Seattle? Seattle vs. Portland - Which Northwest City is Better and Why? What is the Seattle Freeze? Why Is Seattle Called the Emerald City? Did you know these movies were filmed in Seattle?